After waking up this morning to realize that my LaCie external drive with EVERYTHING I digitally own is damaged (I swear to you I’m sitting here in a daze wondering how to tackle the issue after I finish this post), It’s so good to know that I can find solace in my happy place. My happy place = Saturday’s Curls, Coils and Cocktails event at Saviari Tea & Cocktail Lounge. As you know, this has been the baby that I’ve been preparing for over the past month and change. I was also talking about stepping out of my comfort zone and co-hosting the event – which I jumped in and did. Now, even though I am going to try, believe me when I tell you that I the words I type here on this page are nowhere near the astounding vibes that I continue to feel today. I must say, we were a very fashionable and stunning crowd! It was absolutely amazing to see a bevy of hues and beautiful women in one place to celebrate the beauty and each other. There was networking galore; at one point I could hardly hear myself over the boisterous banter. It was truly a sight to see and take in. My partner in crime Bee Quammie (from ’83 To Infinity) and I stood together at one point, looked at the crowd and then at each other, and just revelled at the moment with a huge grin on our faces, followed by a big hug. We were more than proud and so happy to bring this event to you all. Knowing that everyone enjoyed and simply couldn’t get enough, makes me smile from the inside out. As I stated, it was truly a sight to see and an unforgettable tangible vibe that everyone took home with them. Bee and I hosted to the best of our ability (she did a fantastic job). I can only speak on myself, and I will be the first to say that I’m still fresh and green on that end, but the crowd made it a wonderful experience. Believe it or not, it was enough to make me want to do it again in the near future. Our beauty panel consisted of some heavy-hitters here in Toronto: Make-Up artist extraordinaire Thea Mitchell of Cocoa Bloom Cosmetics (worked with the likes of Jill Scott, Glenn Lewis, Jamiroquai etc. ), Trudie Mulalu Owner of Curl Bar Beauty Salon, Denee Dunn Owner of En’tyce Your Beauty, and Yemi S. Wellhauser Owner of Shakura Natural Tips. The panellists were engaging, sincere, informative, personal, and entertaining! The consensus for the night was that the attendees walked away with many pieces of valuable information that will stay with them for a time to come. What a valuable gift in itself, because the panel certainly did share some very poignant points to keep in mind regarding beauty, hair, and beyond. I have to give a shout out to the media in the house – my peoples! It was a pleasure to meet the lovely ladies behind 3 Naturals; I was very happy to see popular sister duo Carcia and Telly HerCastle from Itsmusiclifefashion.com drop by; Toni Daley from ToniDaley.com was in the house with her funky self; publisher of Anancy Magazine Jacqueline L. Scott stopped by and had nothing but praise; and lastly, we were very happy to have Omni’s Caribbean Vibrations in the place! 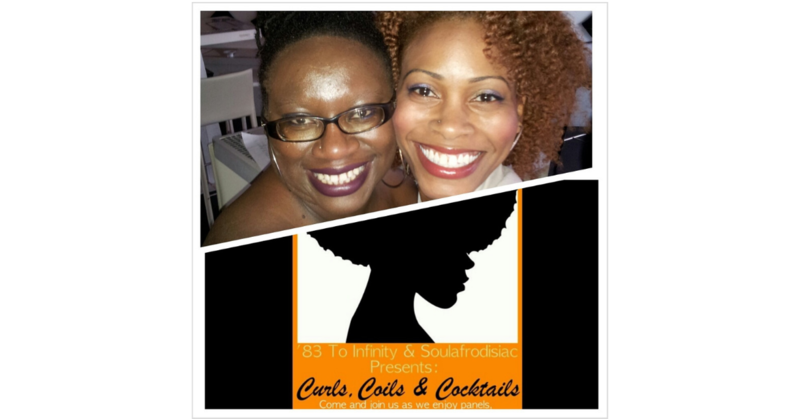 Be sure to check out our Coils, Curls and Cocktails feature on their June 15th show! I’m sending a huge shout out to everyone who assisted with the event – thank you so much for your time! Also, much love and gratitude to our gift sponsor, because everyone was buzzing about the phenomenal array of gifs we had. Thank you so much for supporting! Lastly, I have to say a huge thank you to two very special ladies. Christine Tonkin is the nucleus and mother of this all. She owns and operates the Curls, Coils and Cocktails in Toronto group over on Meetup.com, if it wasn’t for her – this fabulous event would have never come to fruition. Thank you so much Christine for allowing me to take part in organizing this event and being able to bring so many cool sisters together in one amazing setting! Now, you know I can’t leave without saying something about my partner in crime – Bee Quammie. Talk about two peas in a pod in so many ways! Pure jokes all around and we unbelievably usually see eye to eye on a lot of things. I met Bee at my Afrobella event 2 years ago, and we have always kept in touch through social media. We kicked it off from the first night we met, so it was a joy when I realized that she was the one I was going to work with on this event. I must say, it has been such a pleasure and then some, and I certainly look forward to doing it again very soon! Cheers to a great partner and a budding friendship! The million dollar question at the end of the night was: “When’s the next one?” LOL And I’ve seen many ladies say, “I wish I knew about it, I would have loved to attend!” Well, from all of the love we’ve received, I guess all I can say is stay tuned and please join the Meetup.com group to keep abreast of what’s to come. I can go on and on about the soiree, but as you can see, this post is long enough. 😀 It was truly an absolute pleasure meeting you all, and I can’t wait to see you all again! P.S. My girl Tanya Petraglia from TP Photography was our official photographer and will have photos to come very soon! Also, Bee will have her post up tomorrow over on her site ’83 To Infinity. Make sure to check it out!